The airport on the island of Maamigili in Alif Dhaal atoll operated by Jumhooree Party (JP) Leader Gasim’s Ibrahim’s Villa Air has been downgraded to a domestic airport, reports local media. An official from the Civil Aviation Authority told online news outlet CNM that Villa Air had not made the necessary improvements for designation of international airport status. Earlier this month, the government terminated an agreement with Villa Air to manage and develop the Kaadehdhoo regional airport while the fisheries ministry decided not to renew the lease of an uninhabited island given for agricultural purposes to Gasim’s Villa company. 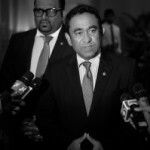 President Abdulla Yameen had denied that the decisions were intended to “impede” the JP leader’s businesses following severe criticism of the government’s flagship special economic zone legislation. The agreement with Villa Air to operate the airport for a period of 50 years was signed during the final days of former President Dr Mohamed Waheed’s administration. Former Transport Minister Dr Ahmed Shamheed – filling a JP slot in cabinet at the time – was sacked in November 2012 after extending the lease of the privately-owned airport in Maamigili for 99 years. In March 2013, Dr Shamheed told Minivan News that President Waheed wanted “credit” for extending the Maamigili airport lease. Despite the dismissal, the decision was not reversed and Shamheed was replaced by JP Deputy Leader Ameen Ibrahim, who signed the Kaadehdhoo agreement on behalf of the government on November 6. 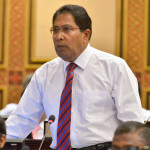 Following his third-place finish with 23.37 percent of the vote in the November 2013 presidential election, Gasim initially announced that the JP would remain neutral. However, the JP’s council decided to endorse Abdulla Yameen against Maldivian Democratic Party candidate, former President Mohamed Nasheed, three days before the second round of the polls on November 16. After the contesting the parliamentary polls in March jointly through the Progressive Coalition, the ruling Progressive Party of Maldives severed its coalition agreement with the JP after Gasim stood for post of Majlis speaker despite the PPM fielding its senior MP Abdulla Maseeh Mohamed.